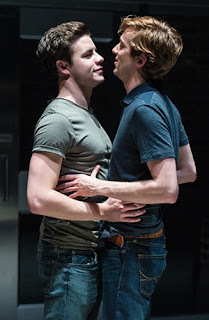 Last Saturday night Stuart​ and I went to see Dominic Cooke’s ferociously cerebral production of Teddy Ferrara at the Donmar Warehouse Theatre in London's glitzy West End. Set in an Amercian university the play is about gay life and gay politics and frankly packed with deeply unsympathetic gay characters. The two main charters Gabe (Luke Newberry) and Drew are nasty self-obsessed careerists who seem so keen to use Teddy Ferrara's (Ryan McParland) suicide as a leg up to better things they don't really have time for anyone but themselves. They both use Political Correctness had a blooded, blunt instrument. Oh-so-basic Jenny (Anjli Mohindra) and the clearly gay Tim (Nathan Wiley) are not breaking up purely because “they’ve been together since freshman year”. Wheelchair-bound Jay (Christopher Imbrosciano) navigates the dancefloor to an instrumental remix of We Found Love in a Hopeless Place without a hint of irony or self-awareness. Author Christopher Shinn’s play is based on the real-life suicide of Tyler Clementi, who killed himself shortly after discovering his homophobic roommate filming his romantic liaisons with a webcam. But based-on-real-events Teddy here is unlikable and his penchant for webcam exhibitionism is at odds with the apparent root cause of his suicide. Even post-suicide Gabe’s very aliveness as he turns up at a meeting — “Sorry I’m late” — kindles a laugh from the audience, because this is a queer community after all where apparently being suicidal is the status quo. So basically Teddy Ferrara is downright unenjoyable for the same reason that it is great: its meticulousness as social commentary on really horrible people. There is no let-up from the constant cringes of bad behaviour. Shinn doesn’t leave us room to sympathise with his characters: it’s as though they’re his vehicles for bombarding us with acute observations on the nuanced cruelties in human nature. Everyone’s desperate for change but the vibe’s too glib for anyone to offer sincere, viable solutions. It’s an honest reconnoitre into a world of pain and an abyss of deafening silence. Hard to recommend but glad we went.